The landmark new Doctor's first scene in Doctor Who is here. 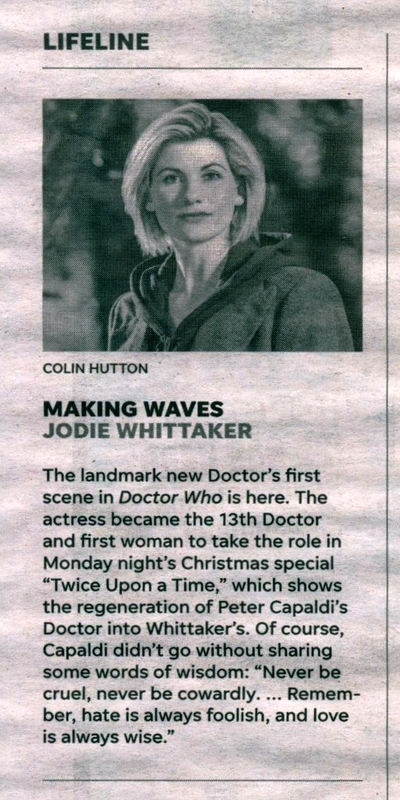 The actress became the 13th Doctor and first woman to take the role in Monday night's Christmas special "Twice Upon a Time," which shows the regeneration of Peter Capaldi's Doctor into Whittaker's. Of course, Capaldi didn't go without sharing some words of wisdom: "Never be cruel, never be cowardly.... Remember, hate is always foolish, and love is always wise." APA 6th ed. : (2017-12-27). Making Waves. USA Today . MLA 7th ed. : "Making Waves." USA Today [add city] 2017-12-27. Print. Turabian: "Making Waves." USA Today, 2017-12-27, section, edition.